It seems that I’ve reached the final stages of my dissertation research (The writing stands at about 45%). Last weekend (yes, we were working late on Friday) my lovely collaborator and myself finally sat down to outline the data mining process we’re going to carry out and what we’re going to do with the data. The problem is not going to be actually getting the data, which seems pretty straightforward and it should *only* take about 28 hours in one computer, 14 in two, 7 in four, and so and so on. The problem is how we are going to process and visualize what is promising to be a network of about 70 000 nodes and 100 000 edges without burning up all of the Cultureplex computer infrastructure and, more importantly, so that it tells us something. We are working on that. experimental part of the research, based on the data I already have. And this is what it is, so far. ‘author’ (in blue) writes a ‘piece’ (in pink) that is published in a ‘medium’ (in red). Fig 1. Up to here, the network is pretty shallow and straightforward to follow. From here, it is evident that both editors are also the most active ‘authors’. 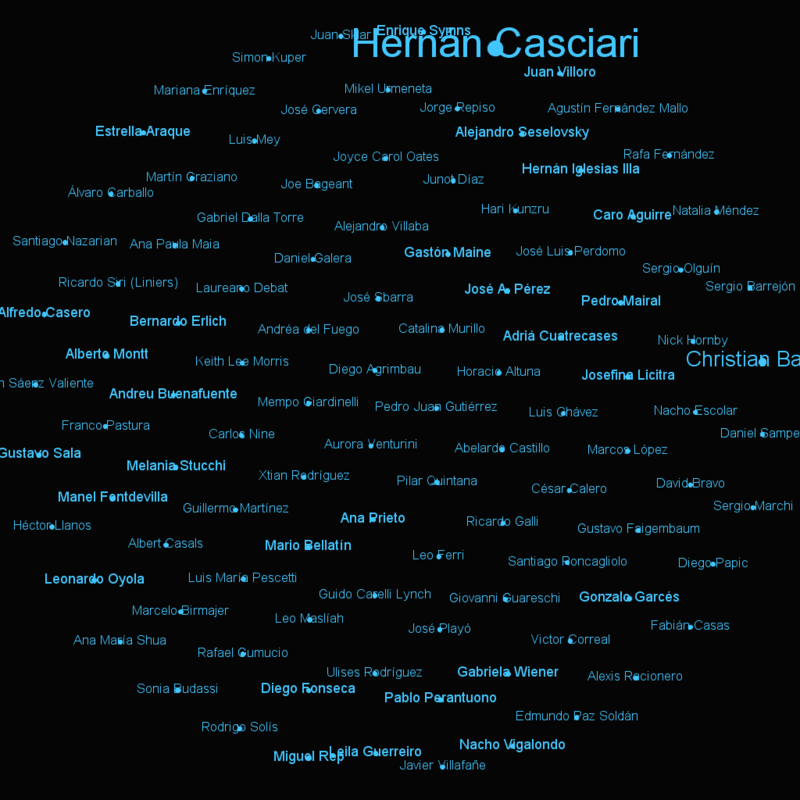 In a different visualization, other authors start to stand out as the recurrent collaborators, while the large majority remain one time contributors to Orsai. The hypohtesis pretty much sustained by this is that Orsai can be read, largely, as a ‘one-pen’ narrative, at least as individual as we can expect in these days and in these media. Hypothesis to explore in the near future: Names will fluctuate more as I include the readers – as the commentators of the project. Our estimate so fat is that on average, each of the almost 500 ‘commentable’ pieces has 100 comments. Fig. 3. All the pieces marked as belonging to a self-referential genre are presented in pink. All the other genres in blue. Fig. 4. Self-referential pieces (still in pink) are connected not just to the editors, as expected, but more interestingly to all five different media. 1. During the first year of Orsai more readers were making fewer comments but amounting to a larger volume (many comments-many readers). This tendency has likely reverted, and for the second year, or for the second half of the second year, fewer readers have amounted for the majority of comments (many comments-fewer readers). 2. Self-referentiality, ie. talk about Orsai itself has been a constant through the two years of publication. The terms to refer to it, however, have changed along with the project(blog, magazine, bar, editorial, etc). What has been the development? I want to suggest it has increasingly been referred to in more concrete terms and notions that the readers can more closely relate to. This question will be solved with NL analysis during the latest stages. 3. A tight community with very clear ‘code’ markers of interaction (like the PRI game at the beginning of each comment thread) has taken shape. What the development of that community is, I can’t tell yet. 4. Because of place-specific ‘props’ (pizzeria, bar) in addition to distribution issues, the readership of Orsai has become more local than it was in its earlier days. Answers to this will also show up after the data mining session. Does anybody want to put some money on any of them? Also, for more, you can visit my poster on Research Day to be held on March 25. Western University, Great Hall. I will be there, and there will be cookies and hummus.